PVMBG reported that during 1 July-31 October gas plumes from Egon rose no higher than 100 m above the crater. Seismicity decreased and was dominated by signals indicating emissions. The Alert Level was lowered to 1 (on a scale of 1-4) on 1 November. Following a phreatic eruption on 15 April 2008, Egon was relatively quiet for a year, prompting the Center of Volcanology and Geological Hazard Mitigation (CVGHM) to lower the Alert Level from 2 to 1 on 16 July 2009 (BGVN 34:10). This report notes seismicity and steaming between July 2009 and June 2010. Egon (figure 1) apparently remained quiet until late March 2010, with an average of one or two daily volcanic earthquakes during January-March. Instruments then recorded a volcanic swarm, with as many as 122 events (amplitudes up to 12 mm, durations up to 45 seconds) during the last few days of March. A volcanic swarm also occurred during the week 31 March-6 April, with 26 events (amplitudes up to 4 mm, durations up to 72 seconds). Since 6 April 2010, small steam plumes rose 10 m above the crater and drifted W.
Figure 1. A shaded-relief map showing the location of Egon on central Flores Island (upper box) and a more detailed view of the elongate island and some active volcanoes (solid trianges). Courtesy of CVGHM. Egon is monitored from the village of Nangatobong, near the island's N coast ~ 6 km NNW of the summit.During the last year and as recent as mid-2010, MODVOLC thermal alerts had been absent. Information Contacts: Center of Volcanology and Geological Hazard Mitigation (CVGHM), Saut Simatupang, 57, Bandung 40122, Indonesia (URL: http://vsi.esdm.go.id/); Hawai'i Institute of Geophysics and Planetology (HIGP) Thermal Alerts System, School of Ocean and Earth Science and Technology (SOEST), Univ. of Hawai'i, 2525 Correa Road, Honolulu, HI 96822, USA (URL: http://modis.higp.hawaii.edu/). PVMBG reported that during 20 January-1 February seismicity at Egon was dominated by signals indicating emissions; shallow volcanic events had decreased. RSAM values increased on 25 January but did not exceed values detected during the previous peak on 12 January; overall seismicity had declined. The Alert Level was lowered to 2 (on a scale of 1-4) and residents were advised to stay at least 1.5 km away from the crater. PVMBG reported that during 1-12 January seismicity at Egon was dominated by shallow volcanic tremor, harmonic tremor, and signals indicating emissions. Seismicity had increased on 15 December 2015, and then fluctuated through 11 January. RSAM increased significantly on 12 January due to an earthquake detected at 0936. PVMBG noted that the pattern of seismicity was similar to that observed before a phreatic eruption on 15 April 2008. The Alert Level was raised to 2 (on a scale of 1-4) and residents were advised to stay at least 3 km away from the crater. On 20 January BNPB reported that activity increased again, prompting the PVMBG to raise the Alert Level to 3. The report noted that access to the Mapitara district was closed due to a strong sulfur dioxide odor in that area, and that 927 people living within 3 km of the volcano had been evacuated (501 people refused to evacuate). Diffuse white plumes rose as high as 50 m above the crater. PVMBG reported that during October-November seismicity at Egon was at baseline levels, characterized by an average of one event per day of both deep and shallow volcanic earthquakes. On 15 December the network recorded 29 shallow volcanic earthquakes, a number significantly above baseline. PVMBG raised the Alert Level to 2 (on a scale of 1-4) that same day and advised residents and tourists to stay at least 1.5 km away from the crater. CVGHM reported that on 17 June the Alert Level for Egon was lowered to 1 (on a scale of 1-4) because seismicity had decreased and emission heights had been lower since January. CVGHM reported that on 7 April the Alert Level for Egon was raised from 1 to 2 (on a scale of 1-4) due to a marked increase in seismic activity since 28 March. Small steam plumes normally rose 10 m above the crater. CVGHM reported that the Alert Level for Egon was lowered to 1 (on a scale of 1-4) on 16 July due to the continued decrease in earthquake activity since 12 May. Small steam plumes were occasionally visible when the weather was clear. CVGHM reported that plume altitudes and seismicity from Egon decreased during 25 April-10 May. On 12 May, small steam plumes were visible. The Alert Level was lowered from 3 to 2 (on a scale of 1-4). CVGHM reported that white plumes from Egon continued to rise to an altitude of 1.8 km (5,900 ft) a.s.l. during 4-14 April. A peak in seismicity was reached during 6-7 April and then declined significantly during 7-15 April. On 15 April, a phreatic explosion produced an ash plume that rose to an altitude of 5.7 km (18,700 ft) a.s.l. and drifted about 25 km W, reaching the town of Maumere. A team of emergency personnel in the closest village to the explosion reported that about 600 people evacuated. CVGHM raised the Alert Level to 3 (on a scale of 1-4). The Darwin VAAC reported that DVGHM reduced the Alert Level at Egon to 3 (on a scale of 1-4) around 8 March. Ash was not visible on satellite imagery during 2-8 March. During 25-27 February, ash plumes from Egon rose to low levels above the volcano and seismicity was dominated by shallow volcanic earthquakes. Egon remained at Alert Level 4, the highest hazard status. According to a news report, as of 17 February recent eruptive activity at Egon had prompted the local government to evacuate hundreds of residents living near the volcano. An explosion at Egon on 14 February at 1830 produced a plume to an unknown height. Egon remained at Alert Level 4, the highest level. An eruption at Egon on 6 February at 0103 led DVGHM to raise the Alert Level to 4 (the highest level) on the following day. The eruption was preceded by an increase in tremor, and consisted of the ejection of "glowing lava" and lapilli-sized material deposited on the volcano's S flank. An eruption occurred on 7 February at 1302 that was similar in size to the 6 February eruption. Before and after the 7 February eruption there was a strong scent of sulfur in the villages of Hebing and Hale. One villager was knocked unconscious due to the gas. 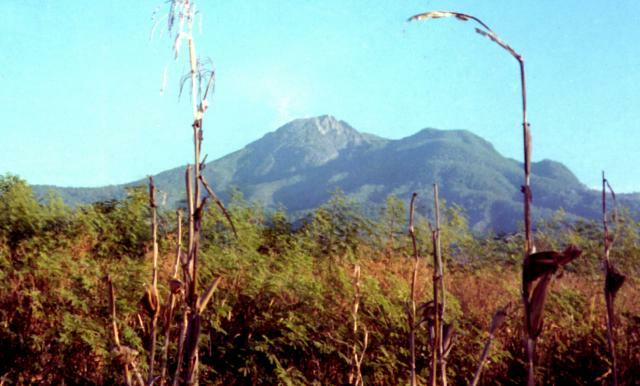 All of the vegetation along a fissure on the volcano's S flank had died, also indicating that there was a strong gas emission. A news article reported that an eruption at Egon on 13 September produced an ash plume that drifted ~70 km downwind according to an Indonesian volcanologist. No ash was visible on satellite imagery. There were no reports of injuries or deaths. About 2,200 villagers living on the volcano's slopes had been evacuated since July 2004. Many of the evacuees reported experiencing respiratory problems and skin irritation. The airport in the town of Maumere was closed due to up to 1 cm of ash deposited on facilities and equipment. Strong volcanic activity at Egon beginning on 3 September led DVGHM to raise the Alert Level from 3 to 4 (on a scale of 1-4) on 4 September. The increase in volcanic activity began on 27 August when plumes rose to ~300 m above the volcano and explosion earthquakes were recorded. This activity prompted DVGHM to raise the Alert Level from 2 to 3. On 3 September an ash plume rose ~1 km above the summit and on 4 September an ash plume rose to ~3 km. As a consequence, all those living in the villages of Baokrengit, Welimwatu, and Natakoli were evacuated. On 6 September, an explosion produced a plume as high as 2.5 km above the volcano that drifted SW. According to a report released by the United Nations Office for the Coordination of Humanitarian Affairs (OCHA), as of 6 September activity at Egon led to the evacuation of 2,100 people. A total of 4,300 were expected to be evacuated. According to news articles, increased volcanic activity at Egon on 31 August led people from at least seven villages near the volcano to temporarily evacuate their homes. Local officials feared that about 2,000 people living on the mountainside were at risk. Reportedly, activity decreased after a few hours and most villagers returned home. According to DVGHM, an eruption began at Egon on 25 July at 2240, consisting of loud rumbling sounds, a strong sulfur scent, and explosions that rose to 1-1.5 km above the summit. A thick, black plume drifted NNW from the volcano. Interpretations of seismic data revealed that the eruption lasted about 2.5 hours. According to the Darwin VAAC, a plume was visible on satellite imagery. DVGHM reported that about 630 residents near Egon self evacuated from the villages of Egon, Nangatobong, and Itoper. According to a news article, about 1,400 people evacuated. At 1500 on 26 July seismographs recorded nearly continuous explosions produced plumes to ~250 m above the volcano. During 5-11 July, observers watching Egon volcano saw it emit white plumes of variable density that typically rose 25-75 m above the summit. The seismograph recorded a continuous series of 'emission earthquakes' with amplitudes of 2 mm. Egon's hazard status remained at Alert Level 2 (on a scale of 1-4). According to news articles, increased volcanic activity began at Egon on 3 July. Ash from an explosion on the night of the 3rd drifted as far W as Maumere, the capital of Flores. About 2,000 residents near the volcano were evacuated. The four villages worst affected were Egon Gahar, Natakoli, Hale, and Hebing. According to DVGHM, two small explosions occurred at Egon, producing ash clouds to heights of ~150 m. Egon was listed at Alert Level 2 (on a scale of 1-4). According to a news report, local scientists found that volcanic activity that began with an eruption at Egon on 29 January had significantly decreased around 5 February. More than 1,000 of the ~5,600 residents who were evacuated from near the volcano returned home on the 5th. Volcanic activity began at Egon on 29 January around 0400 when a landslide traveled down the volcano's E crater wall. Around 1700 an explosion produced a black ash cloud to a height of ~750 m above the summit. During 30-31 January, loud noises from the volcano were followed by emissions of gray ash clouds. In addition, there was a strong scent of sulfur every 50-60 minutes. Visual observations on the 31st revealed that a new solfatara tunnel (sulfur-rich fumarole) was created on the S side of the volcano. Small volcanic earthquakes, deep-volcanic earthquakes, and harmonic tremor were recorded. DVGHM put Egon at Alert Level 3 (on a scale of 1-4) beginning on 2 February. The volcano did not previously have an Alert Level. The Darwin VAAC reported that ash was not visible on satellite imagery. The volcanism at Egon led to the evacuation of residents near the volcano on 29 January. According to a report by the United Nations Office for the Coordination of Humanitarian Affairs (OCHA), local authorities ordered the evacuation of the villages of Hale, Hebing, Egon Gahar, and Natakoli, which were in high-risk areas on the S side of the volcano. By 31 Jan, ~3,900 people had reached Maumere city, ~35 km away. As many as 6,000 people were evacuated by 1 February. At least one death was reported, although it was not clear if it resulted from the volcanic activity, evacuation process, or other causes. According to news reports, many of the evacuees suffered from respiratory problems, dengue fever, malaria, and diarrhea. There were also reports of looting in the evacuated villages. This first Bulletin report discussing Egon describes the sudden appearance of volcanic activity there in January 2004. Heavy rains fell over Egon and its surrounding area on 28 January. At 0400 on 29 January, local people heard the sound of the E crater wall collapsing inward. That was followed at 1700 by an explosion and a black ash cloud rising ~ 750 m above the summit. On 30-31 January further noise was followed by gray ash clouds and the odor of highly concentrated sulfur every 50-60 minutes. Visual observation on 31 January revealed a new solfatara. Volcanic earthquakes were detected on 30 January (intensity III on the Modified Mercali (MMI) scale), and a seismometer installed on 31 January recorded a type-A deep-volcanic earthquake at 1610 and two harmonic tremor events (amplitude 0.5 mm) at 1800. At 2227 an explosion was heard and instrumentally recorded for about 70 seconds. On 1 February, instruments recorded two tremor events and one type-A volcanic earthquake. Egon was placed on Alert level 3 (on a 1-4 scale) on that day. United Nations reports and news reports from around 31 January indicated that up to 6,400 people were being evacuated from near Egon volcano as a precautionary measure due to "smoke," ash, and other possible emissions. The news cited evacuations from the mountain villages of Hale, Hebing, Lere, Natakoli, Pedat, Bau Krengat, and Kelawair, with refugees going to Maumere (the island's main town, 25 km W of the summit). There were reports of 1 or 2 deaths, but it is not entirely clear that they were related to volcanic activity, evacuations, or other causes. The European Volcanological Society (SVE) posted this report on the UN's Relief Web website: "One person has been reported killed from smoke and ash inhalation from the eruption of Egon volcano. Thick clouds of smoke and a great discharge of hot ash, large chunks of sulfur and volcanic rocks were seen nearby. The eruption caused panic among residents nearby, and they fled the mountain villages . . . . Eyewitnesses said the lower part of the crater was seen bursting and that was believed to be the main outlet for the hot lava that spewed from the volcano.."
Agence France-Presse published a photo (by Romeo Gacad) with a distant aerial view of Egon's summit as it appeared around sunset on 1 February. A thin plume rose gently above the summit. Lower portions of the photo were in cloud. A 2 February 2004 United Nations (OCHA) report stated that "Volcanologists continue monitoring the activity of Mt. Egon closely. Since the beginning of February, a decrease in seismic activity and emissions has been registered." This and another UN report noted, as of 13 February ~ 5,000 people had been evacuated and had been accommodated in 14 temporary government shelters. The report went on to note "A gradual return of the evacuated population has already begun and is expected to continue if current conditions remain unchanged. As of 4 February some 600 people have already returned to their villages." Information Contacts: Dali Ahmad, Hetty Triastuty, Nia Haerani, and Suswati, Directorate of Volcanology and Geological Hazards (formerly VSI), Jalan Diponegoro No 57, Bandung 40122, Indonesia (URL: http://www.vsi.esdm.go.id/); Dan Shackelford, 3124 E. Yorba Linda Blvd., Apt. H-33, Fullerton, CA 92831-2324, USA; United Nations, Office for the Coordination of Humanitarian Affairs (UN OCHA), S-3600, New York, NY 10017, USA (URL: https://reliefweb.int/); Henry Gaudru, Société Volcanologique Européenne (SVE), C.P.1-1211 Geneva 17- Switzerland (URL: http://www.sveurop.org/). Volcanic activity began at Egon in late January when ash explosions caused local ashfall (BGVN 29:03). Activity subsequently decreased, and evacuated residents returned home. Reports from the Directorate of Volcanology and Geological Hazard Mitigation (DVGHM) indicated that in May 2004 only ten A-type volcanic earthquakes were detected. These types of events increased to 19 during June, when three shallow B-type volcanic earthquakes were also registered (table 1). Table 1. Seismicity at Egon during 20 June-29 August 2004. Courtesy of DVGHM. Volcanism resumed at 1930 on 3 July 2004 when small explosions along with rumbling sounds and a white- gray ash plume rose 100 m and caused ashfall to the SE. Ash from a second small explosion that began with increasing A-type volcanic earthquakes on 6 July at 0100 again drifted SE. Maximum amplitudes (peak-to-peak) of the explosion earthquakes were 1 mm and lasted 60 seconds. White plumes rising to ~ 75 m above the summit were then observed during 5-18 July. Continuous emission earthquakes were recorded during the week of 5-12 July with 2 mm amplitude. After 11 July a PS-2 telemetered seismograph was operational. A significant ash explosion accompanied by rumbling sounds at 2240 on 25 July 2004 sent a plume ~ 1,000-1,500 m above the summit. A thick black ash column drifted NW and the smell of sulfur gas was very strong. Seismic data indicated that the eruptions lasted about 2 hours and 30 minutes; tremor amplitude was 30-35 mm. Ashfall affected the Egon (3 km NW) and Nangatobong (7.5 km NNW) villages, and 339 families evacuated to Waigete. Daily seismic events increased from 14 to 36 prior to the eruption. Ash explosions continued through 1600 the next day, sending plumes ~ 250 m above the summit at intervals of about a minute. Additional evacuations occurred from Egon, Nangatobong, and Itoper villages. Another explosion at 2200 on 28 July sent volcanic material to a height of 750 m; ash drifted WSW. Recorded tremor emission showed maximum amplitudes decreasing from 5 mm to 2 mm. By the week of 9-15 August observers were only reporting a thin white plume to ~ 100 m above the summit, although tremor was still being recorded. Similar activity continued through 22 August. On 27 August two eruptions ejected ash plumes more than 250 m high. Shallow volcanic earthquakes increased significantly during the week of 23-29 August. Information Contacts: Dali Ahmad, Hetty Triastuty, Nia Haerani, Suswati, and Sri Kisyati, Directorate of Volcanology and Geological Hazard Mitigation, Jalan Diponegoro No. 57, Bandung 40122, Indonesia, URL: http://www.vsi.esdm.go.id/). Table 2 below tabulates the seismic activity by date of the volcano prior to and subsequent to its eruption on 6 February 2005, but little was reported concerning that event. The volcano erupted again on 7 February. That eruption was accompanied by a strong smell of SO2 or H2S in the villages of Hebing and Hale and apparently rendered a villager unconscious. Table 2. A summary of counts for different earthquake types (type B volcanic, type A volcanic, emission, low frequency, and tectonic), tremor, amplitude, and Alert Level at Egon volcano. Unreported data indicated by "--". Courtesy of the Directorate of Volcanology and Geological Hazard Mitigation (DVGHM) DVGHM. On 8 February 2005 a fissure about 1 km long appeared along the southern slope. Vegetation along the fissure's margins had died, indicating that a gas blow out had occurred there. On 14 February 2005 at 1830 another explosion occurred. It was accompanied by significant seismic activity (see table 2). This latest eruption ejected ash and glowing material as high as 50 m above the summit. Volcanic earthquakes were frequent. Distances increased for electronic distance measurements (EDM) during April, July, and October 2004 and during February 2005 (the last four measurements). During 25-27 February 2005 ash plumes rose to 50 m high. Volcano status remained at alert level 4 (the highest hazard status). Information Contacts: Dali Ahmad, Hetty Triastuty, Nia Haerani, and Sri Kisyati, Directorate of Volcanology and Geological Hazard Mitigation (DVGHM), Jalan Diponegoro No. 57, Bandung 40122, Indonesia (URL: http://www.vsi.esdm.go.id/). The Center of Volcanology and Geological Hazard Mitigation (CVGHM) indicated that after the 28 January 2004 eruption of Egon, phreatic eruptions often occurred without preceding increases in seismicity. Eruptions reported during July, August, and September 2004, and during February 2005 occasionally resulted in evacuations. During 4-14 April 2008 visual observations showed daily white plumes rising to an altitude of 1.8 km. This activity was considered to be normal. A peak in seismicity was reached during 6-7 April but then declined significantly through 15 April. On 15 April a phreatic explosion produced an ash plume that rose to an altitude of 5.7 km and drifted ~ 25 km W, reaching Maumere City, the capital of Flores. The emissions were accompanied by thunderous noise. A team of emergency personnel in the closest village to the explosion reported that about 600 people evacuated from three villages. No fatalities were reported. During 15 April to 10 May, earthquakes declined in number. The altitudes of "eruption plumes" became smaller during the later half of April: on 20, 24, and 28 April, plumes rose to altitudes of 3.7 km, 2.6 km, and 1.8 km, respectively, although the character of the plumes was not described. During 27 April-13 May instruments measuring deformation indicated a return to background rates. Diffuse white plumes rose above the summit on 12 May. Communities on the W flank within 1 km of the peak remained on high alert due to the presence of gasses and the possibility of future phreatic eruptions. A search of the MODVOLC website found there were no thermal alerts for Egon during this report's time frame. Information Contacts: Center of Volcanology and Geological Hazard Mitigation, Saut Simatupang, 57, Bandung 40122, Indonesia (URL: http://vsi.esdm.go.id/); Hawai'i Institute of Geophysics and Planetology (HIGP) Thermal Alerts System, School of Ocean and Earth Science and Technology (SOEST), University of Hawai'i, 2525 Correa Road, Honolulu, HI 96822, USA (URL: http://modis.higp.hawaii.edu/). Since the eruption of 28 January 2004, Egon has frequently undergone phreatic eruptions without any significant increase in volcanic tremor or earthquakes. Our last report on Egon (BGVN 33:08) summarized the gradual decline of activity during April-May 2008. This report overlaps with the earlier one but benefits from better report translation. The closest large city to Egon is Maumere (Flores), ~ 25 km WNW. The Center of Volcanology and Geological Hazard Mitigation (CVGHM) provided additional information on the April-May 2008 disturbances (BGVN 33:08). A spike in the volcano's activity took place on 6-7 April 2008 (table 3). Reports noted a subsequent decrease in earth movements. On 4-15 April 2008 thin white smoke was seen rising ~ 25-50 m above the crater. This emission was considered a daily activity; however seismicity became evident. Table 3. Seismicity and observations of activity at Egon during 5-28 April 2009. "?" indicates no data reported. Courtesy of CVGHM. 05 Apr 2008 3 0 -- Usual daily occurrence of hot air blasts and whitish smoke. 06 Apr 2008 38 93 -- Hot air blasts and "whitish smoke," rising 25-50 m.
07 Apr 2008 15 2 -- Hot air blasts and "whitish smoke," rising ~35 m.
08-14 Apr 2008 6 3 -- Hot air blasts and "whitish smoke," rising ~25 m above the crater and a significant decrease in volcanic quakes. 15 Apr 2008 -- -- 1290 s Ash plume to 4,000 m height. 20 Apr 2008 -- -- 1073.5 s Ash plume to 2,000 m height. 24 Apr 2008 -- -- 91 s Ash plume to 850 m height. 28 Apr 2008 -- -- 60.5 s Ash plume to 75 m height. On 15 April 2008 a phreatic eruption occurred and CVGHM raised the Alert Level to 3 ("Saga" - on a scale of 1-4). Visual observations indicated that the ash column rose ~ 4,000 m above the crater; however the ash was not identifiable from satellite survey due to cloud cover. The eruption was accompanied by a "grumbling" sound. An ash/cinder cloud reached the city of Maumere (Flores), ~ 20 km WNW. Because of the height of eruptive plume, authorities at Waioti Airport serving Maumere were alerted. The emergency response team, together with the district government of Sikka (Flores) onsite at the villages closest to the eruption, reported that ~ 600 persons from local villages evacuated; they reported no fatalities. The Darwin Volcanic Ash Advisory Center (VAAC) issued two alerts of the volcanic activity at Egon, on 15 and 16 April 2008. Between 15 April and 11 May 2008, four explosive tremor events were recorded (table 3). Land deformation in the vicinity of the volcano stabilized after 27 April 2008. During 15 April-10 May 2008, 1-2 deep volcanic earthquakes occurred daily. Between 25 April to 10 May, shallow volcanic earthquakes decreased from 6-20 daily to 1-10 daily. During that time, tremors caused by hot air blasts continued to be recorded, reaching a rather high total range of around 6-47 events per day. The higher values are comparatively large; a normal stasis condition is considered to be a ~ 1-9 hot air blast signals per day. On 12 May 2008, hot air tremors had amplitudes of 2 mm and durations of 5-11 seconds. Whitish smoke could frequently be seen reaching a height of only 10 m above the peak. On 13 May, CVGHM downgraded the hazard status to Alert Level 2 (Waspada). For the rest of May 2008 and for more than a year, Egon's was relatively quiet. From 4 March to 12 July 2009, type-A earthquakes were recorded at a rate of 1-2 events per day; type-B earthquakes, 1-3 events per day; (except on 6 May when six were recorded). During that interval there were 1-9 hot air blast earthquakes per day and the hot air blasts of smoke were generally whitish in color and were rose to ~ 10 m over the peak. Eruptive earthquakes were absent. Although tremor was still recorded (with an amplitude of 0.5-4 mm), since 4 March 2009, earth movements have decreased. On 17 July 2009, the CGVHM. downgraded the hazard status to Alert Level 1 (Normal). MODVOLC review of activity shows no thermal indicators of volcanic activity. Gunung Egon, also known as Namang, sits astride the narrow waist of eastern Flores Island. The barren, sparsely vegetated summit region has a 350-m-wide, 200-m-deep crater that sometimes contains a lake. Other small crater lakes occur on the flanks. A lava dome forms the southern summit. Solfataric activity occurs on the crater wall and rim and on the upper S flank. Reports of historical eruptive activity prior to explosive eruptions beginning in 2004 were inconclusive. A column of "smoke" was often observed above the summit during 1888-1891 and in 1892. Strong "smoke" emission in 1907 reported by Sapper (1917) was considered by the Catalog of Active Volcanoes of the World (Neumann van Padang, 1951) to be an historical eruption, but Kemmerling (1929) noted that this was likely confused with an eruption on the same date and time from Lewotobi Lakilaki. Stolz A J, Varne R, Davies, G R, Wheller G E, Foden J D, 1990. Magma source components in an arc-continent collision zone: the Flores-Lembata sector, Sunda arc, Indonesia. Contr Mineral Petr, 105: 585-601. Wheller G E, Varne R, Foden J D, Abbott M J, 1987. Geochemistry of Quaternary volcanism in the Sunda-Banda arc, Indonesia, and three-component genesis of island-arc basaltic magmas. J. Volcanol. Geotherm. Res., 32: 137-160. There is no Deformation History data available for Egon. There is no Emissions History data available for Egon. Gunung Egon volcano, seen here from the NW, sits astride the narrow waist of eastern Flores Island. The lower flanks of Egon volcano extend nearly to both the Flores Sea on the north and the Savu Sea to the south. The unvegetated summit of the volcano is capped by a 350-m-wide crater. A lava dome forms a lesser summit to the south. 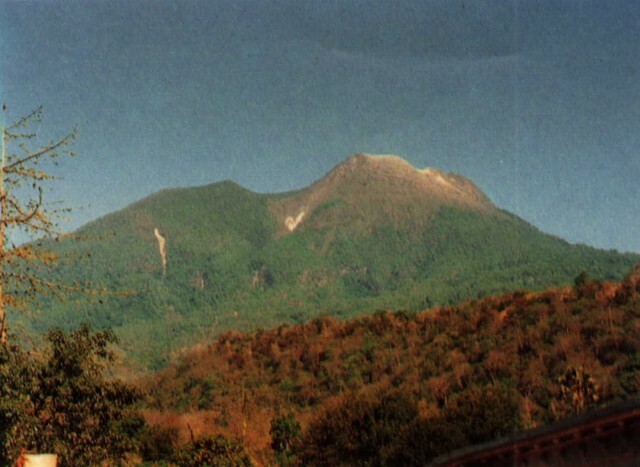 Photo by Tulus, 1990 (Volcanological Survey of Indonesia). The crater of Gunung Egon volcano contains a shallow lake in this 1920's view from the east. Fumarolic plumes rise from the shores of the lake, which occupies the 350-m-wide, 200-m-deep crater. Photo published in Kemnerling 1929, "Vulkanen van Flores" (courtesy of Volcanological Survey of Indonesia). Fumaroles line the walls of the summit crater of Egon volcano. A lake occupies the floor of the crater in this 1920's view from the southern crater rim. The northern crater rim marks the 1703-m-high summit of the volcano. A lava dome (left) was constructed within a somma wall, called Kokker, which forms the slope at the right side of the photo. The summit of 1703-m-high Gunung Egon (center) rises above the northern coast of Flores, visible below the gap in the crater rim at the right. A lava dome (center) occupies the summit of Egon volcano. Gunung Egon sits astride the narrow waist of eastern Flores Island, and its lower flanks extend nearly to both the Flores Sea on the north and the Savu Sea to the south. The unvegetated summit has a 350-m-wide, 200-m-deep crater that sometimes contains a lake. Other small crater lakes occur on the flanks of the 1703-m-high volcano. Photo by Volcanological Survey of Indonesia. 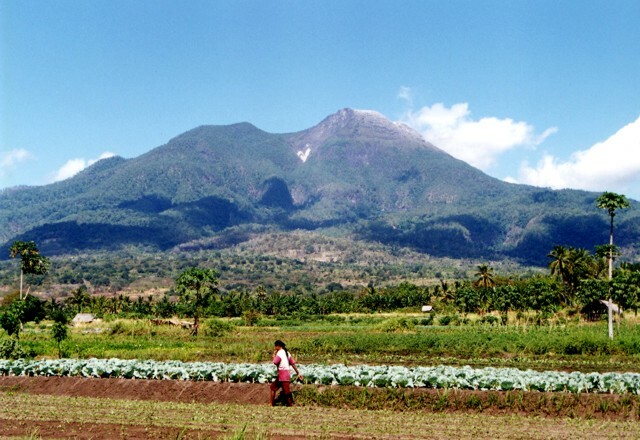 Egon volcano, with its vegetation-free summit lava dome, rises above farmlands at its base. The 1703-m-high Gunung Egon sits astride the narrow waist of eastern Flores Island, and its lower flanks extend nearly to both the Flores Sea on the north and the Savu Sea to the south. The summit has a 350-m-wide, 200-m-deep crater that sometimes contains a lake. Other small crater lakes occur on the flanks of the volcano. 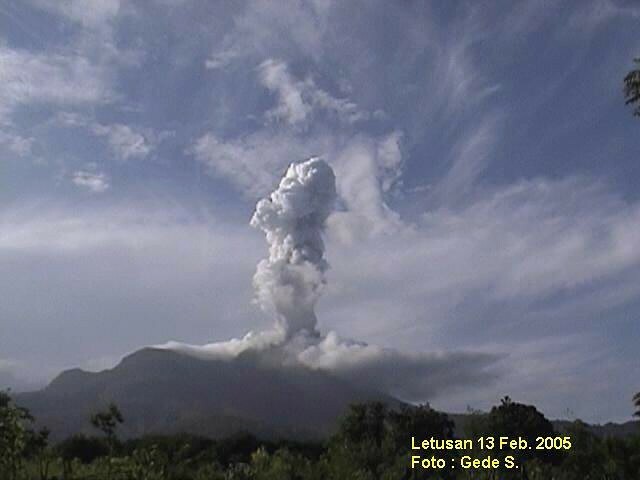 Photo by Igan S., 2004 (Centre of Volcanology & Geological Hazard Mitigation, Volcanological Survey of Indonesia). An eruption plume rises above Egon volcano on February 13, 2005. Explosive eruptions on February 6-7, 2005, larger than in 2004, ejected ash and lapilli. On February 14 another explosion ejected ash and glowing material to about 50 m above the summit. According to a news report, as of February 17 recent eruptive activity at Egon had prompted the local government to evacuate hundreds of residents living near the volcano. Minor ash plumes were reported during February 25-27. Photo by Gede S., 2005 (Centre of Volcanology & Geological Hazard Mitigation, Volcanological Survey of Indonesia). There are no samples for Egon in the Smithsonian's NMNH Department of Mineral Sciences Rock and Ore collection. Large Eruptions of Egon Information about large Quaternary eruptions (VEI >= 4) is cataloged in the Large Magnitude Explosive Volcanic Eruptions (LaMEVE) database of the Volcano Global Risk Identification and Analysis Project (VOGRIPA).